Record your positive thoughts of gratitude each day while experiencing the relaxing sounds and images of the ocean. Add pictures to express your day’s thoughts and feelings, read an inspirational quote of the day, and wirelessly backup or export as a web page all of your information. A key component of the Law of Attraction is gratitude. Keeping a Gratitude Rock with you is a unique way to remind yourself to be thankful for all the good things in your life. 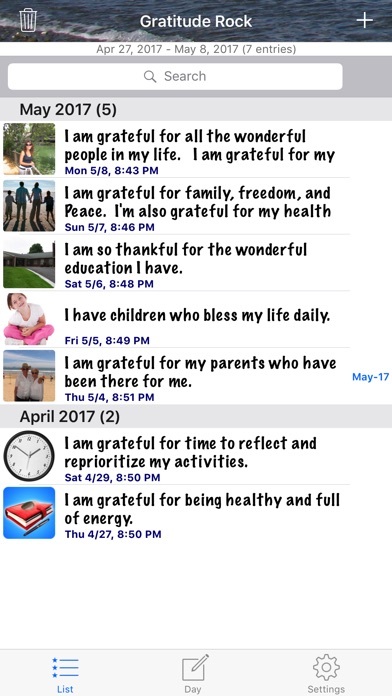 This app helps you focus on things you are grateful for and will help to bring more of those things into your life and enrich your life. • Get in a relaxing mood by listening to the sounds of the ocean waves hitting the shore. • Write multiple entries of your thoughts and feelings for each day in the journal. • Add up to 3 pictures per day from your camera or photo albums to enhance your memories of that day. View the thumbnail images or select 'View Larger' to display a picture viewer and swipe horizontally to scroll through your daily pictures at a larger size. • Read an inspiring quote each day and copy it to the clipboard if desired. • Change the background picture to one of six built-in images or add your own picture from your photo album or camera. • Adjust the brightness level of the background image to enhance text readability. • Email a day's text and pictures. • View the contents of your journal as a web page wirelessly from your computer via your browser (local WiFi connection). • Set a daily alert to remind you to add an entry to your journal. 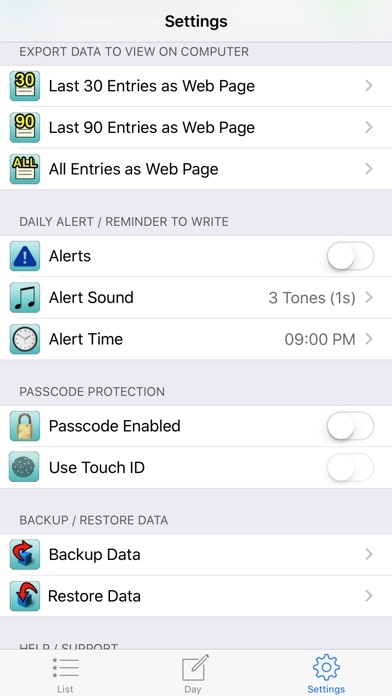 Set the alert sound (25 sounds available) and the daily alert time. • Select up to 4 fonts with 16 colors and adjust the text size. • Enable Auto Hide Buttons to have the buttons fade away after a few seconds so they are not in the way. Tap where they used to be to bring them back. • Easily go back and read your thoughts and view your pictures from any previous day by scrolling to a date. Advance forward/backward through the daily entries by using the previous/next buttons. Hold them down to auto advance. • Perform a text search on your journal (Last 30 days, 90 days or all) to find important events from the past. • Backup or restore your pictures and text wirelessly to/from any desktop computer using your computer’s browser (local WiFi connection). • Optionally secure all your information with a passcode to get access to your diary of information. • Change the date of any entry. • Use a 3D touch quick action to add an entry. 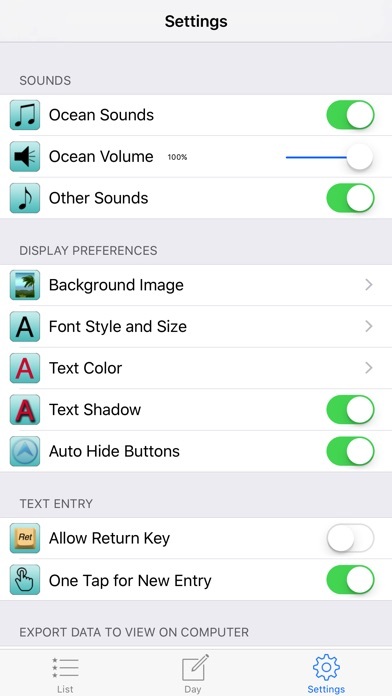 • Enable or disable ocean sounds or additional sounds. Adjust the ocean volume level. • Display or hide the pictures and quote on the screen. • All dates are displayed using the device's international date format settings. For each day, each text entry is preceded by an image of a Gratitude Rock. Multiple sentences can be entered per entry. Text is entered on top of the image of the ocean or any picture you choose. With our busy lives today, taking the time to write the things you are grateful for in this Gratitude Rock journal combined with the principles of the Law Of Attraction (book/movie: The Secret) can help you to enrich your life and reach your full potential. Additional features will be added, so we welcome your suggestions as to future enhancements. 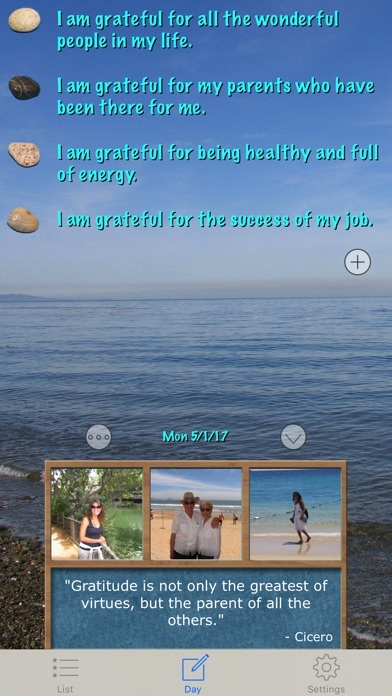 Check out our Web site at www.EnergizeSoftware.com for more information on Gratitude Rock or to explore the other apps that we offer. iPhone X support and iOS11 compatibility.